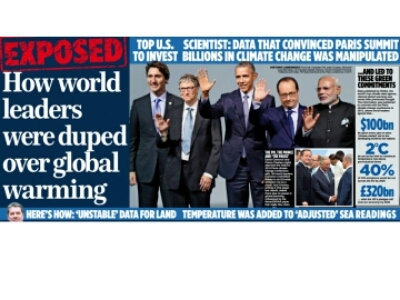 (Feb 6/7th, pic above) “The revelations in Mail on Sunday (Feb 5th) and Daily Mail from Data Science, Climate and satellites Consultant John J Bates – an insider – that NOAA manipulated data to show false warming are the death-knell of the Man-Made Climate Change hoax and has massive immediate implications. “These latest revelations confirm what we in WeatherAction and many other independent Climate Realist / Skeptic scientists have been saying for years. [For specific evidence eg that USA ‘warming’ and world ‘warming’ in recent years are 100% due to ‘data adjustment’, ie fraud, see twitter @SteveSGoddard & LHS of www.WeatherAction.com home page]. “The UN Climate Change Committee, the IPCC (Intergovermental Panel on Climate Change), must now be closed down. President Trump is 100% right to announce intentions to defund this fraudulent operation and to terminate USA support for the delusional globalist de-industrializing corporate plunder of the Paris (2016) accords. “All Anti-CO2 measures worldwide – such as the UK Climate Change Act 2008 and similar measures in other countries, must now be repealed. All the stupid measures and attacks on jobs and living standards that flow from them – such as Carbon taxes and surcharges, wind-farms, bio-fuels and the massive programme of dam building and consequent environment drowning and indigenous tribal wholesale ethnic-cleansing in Brazil – must be ended. “There is no scientific basis whatsoever for the claim that mankind’s CO2 has ANY effect on climate. The fact is that CO2 levels are an EFFECT of changes in climate (temperature) NOT A CAUSE (see http://bit.ly/2iIoMXN ). See also recent post at Climate etc. ← It’s official – Vancouver’s snowmageddon has been recordbreaking! Sheikh Saud Al-Shuraim announced through its official Twitter In an urgent statement about the appearance of a sign of the Day of Judgment, that mark, which they said linked the snow that fell on one of the mountainous areas in Saudi Arabia. He also pointed out that in those days a lot of things happen in our lives which refers to the approach of the Day of Judgment and that some do not be aware of it, but to actually show God Almighty and the Prophet is explained in the Quranic verses and prophetic traditions. He said God Almighty “came close to people who are self-employed inadvertently exposed,” where the person does not realize die at any time and in any land also die For everyone that works for the Hereafter because the world is transient and does not take such an individual thing which is late. Saud ibn Ibrahim ibn Muhammad al-Shuraim (Arabic: سعود بن ابراهيم بن محمد الشريم،, born 19 January 1966) is one of the Imams and khateeb of the Grand Masjid (Masjid al-Haram) in Makkah. He holds a doctorate (Ph.D) and is a Professor of Sharia and Islamic studies at the Umm al-Qura University in Makkah, and was recently appointed as a Dean and “Specialist Professor in Fiqh” at the University. He is also known as a researcher in Fiqh and he follows the Hanbali madhhab. He is a judge and a writer who has composed many books on Aqidah, fiqh, and Arabic poetry. Shuraim leads the Taraweeh prayers during Ramadan in Mecca since 1991. He also led the Salat al-Janazah (funeral prayer) for late Crown Prince Nayef bin Abdulaziz on 17 June 2012 after Maghrib (sunset) prayer in Masjid Al Haram. King Abdullah of Saudi Arabia and the royal families were present at this funeral. His voice has been widely recorded and is internationally distributed by various mediums. When is the long-term global temperature drop supposed to begin? Even if one doesn’t look at fake NOAA temperatures, for example satellite-based temps, they are still near or at record warm the past year. How can it be said we’re in a mini ice-age when global temps are so high? I am simply after the truth. We cannot deny the recent warmth. We can only say ‘wild jet stream, due to mini ice age conditions’ for so long, eventually we have to acknowledge what’s going on with global temperatures. Little ice age means much colder global temperatures, not just jet stream fluctuations. But colder, long-term global temperatures have not manifested themselves. Just to be clear, I am not an anthropogenic global warming believer, but at the same time I don’t believe it is right to deny recent natural warmth, which is relatively warm even according to accurate satellite readings – despite all the talk of having mini ice age jet stream/circulation patterns. Perhaps I am being too hasty and the temperature drop is not too far off. But I think many others want an explanation as well. For example it doesn’t look good on solar/astro physicists when they say we’re in or going into a mini ice age, but right now we have all this warmth. Of course warmth is good for life, and I support that aspect of it. However, it makes the mini ice age forecast look non-believable to the general public when the current warmth isn’t explained. That’s all, Cheers and thanks again.